Are you a shrewd club? When you are paying upwards of £450 for a new kit, £600 for referees’ fees and heaven knows what in ever-increasing pitch fees, a season playing grassroots football does not come cheap. It pays to be shrewd. Why wouldn’t you want a brand new kit from a top supplier for free? MyClubBetting.com could be just the solution your club needs. Whether having a crafty accumulator on the Premier League or having a flutter on the Grand National, many of us like the odd bet. We are creatures of habit, we don’t like change, and that is especially the case when it comes to our choice of bookmaker. That’s understandable. But what if your club had its own betting service, which offered everything your regular bookmaker did? And that service did not cost your club a penny to set up? What if it offered you £20 of free bets and helped your club get free kit? What if it also gave back 20% of the net revenue generated every month? You’d be mad not to switch, right? The MyClubBetting.com premise is simple: the club receive a free betting service at no cost. The members and supporters bet via the club service and the club is rewarded with free sports equipment. But unlike other bookmakers, MyClubBetting.com gives money back. No less than 20% of net revenues - £20 in every £100 - return to the respective club for development every month. There is no catch. No hidden costs. Just a bookmaking service that gives back. Carlisle's Eden Thistle FC, who play in the Westmorland League, are glad they took advantage. 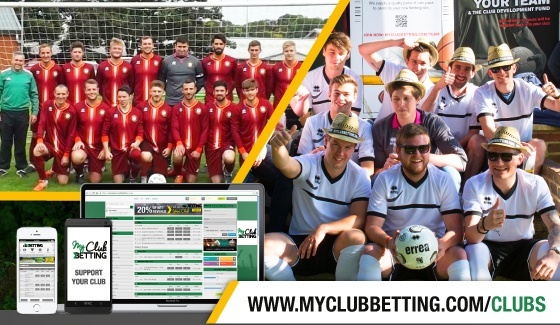 “My Club Betting provides a fast, efficient service that our supporters are very happy with, because not only does it offer a huge range of sports betting opportunities, they know that they are supporting their club," said Eden Thistle's Philip Wynne. "This has been a big cost-saving benefit and it is a great initiative to help grassroots sports and clubs like ours. We also continue to benefit from a revenue stream – no other bookmaker gives back 20%, so it made sense to bet via My Club Betting." Like all clubs that get their own My Club Betting service, Eden Thistle FC received a FIFA-inspected match ball when one person signed up, another two match balls and a large kit bag when six people joined in, then a full kit for 15 players when 11 people signed up and used the service. So, isn’t it time you got smart and found out what MyClubBetting.com could do for your club? To activate your club's own betting site just login to your club website and, from your dashboard, go to 'Customise' and then 'Add-on'. Click on the 'Recommended' tab and activate the My Club Betting feature, which will then appear on your website. All this takes just a few seconds. To find out more, or if would appreciate a hand setting your site up, call My Club Betting on 01883 772929 in office hours, or visit MyClubBetting.com for more information.